The answer to the question posed by Alex J. Grant in his March 3 editorial, "Who Put the SBC In Charge?" is actually quite simple. When the residents of the Town of Longmeadow voted overwhelmingly at two separate town meetings and at the ballot box to obtain funds from the Commonwealth of Massachusetts for preparation of a feasibility study and then for construction of a new high school, we as a community agreed to comply with the terms and conditions of the Commonwealth's school building assistance program. All state funding of school building projects in Massachusetts is overseen by the Massachusetts School Building Authority (the "MSBA"), pursuant to Massachusetts General Laws Chapter 70B. The MSBA was established by Chapter 70B to promote "the thoughtful planning and construction of school facility space in order to insure safe and adequate plant facilities for the public schools, and to assist towns in meeting the cost thereof." M.G.L. c.70B, §1. All cities and towns seeking funding for school projects from the school building assistance program are required to comply with regulations adopted by the MSBA at 963 CMR 2.00, which provide a clear legal and procedural framework for the design and construction of MSBA-funded projects. The MSBA regulations clearly require the establishment of a school building committee ("SBC") in each municipality seeking such funding, as well as set forth the responsibilities and the membership of a SBC. The regulations require the town to make "a reasonable effort" to include representatives from each of the Select Board and the School Committee, the Town Manager, the Superintendent of Schools, the manager with responsibility for maintenance of the new facility, the school principal of the facility, a local budget official, and community members with experience in architecture, engineering and/or construction, among others. The establishment of the SBC in Longmeadow followed the letter of the law as set forth in Chapter 70B and in the accompanying MSBA regulations, and complied with our Town Charter. Section 4-4 of the Town Charter gives the Select Board and the School Committee the authority to establish new committees as necessary to conduct town business. The Select Board and the School Committee held joint open meetings on June 16, 2008 and June 23, 2008, to interview and then vote on the proposed community members of the SBC. Those members were thus vetted by publicly elected officials in open session. As noted above, the other members are specifically enumerated in the MSBA regulations. The July 21, 2008 letter from E. Jahn Hart, then-Superintendent of Longmeadow Public Schools, to the MSBA (erroneously cited by Mr. Grant as being sent by the Town Manager) requested approval of the SBC membership as required by the MSBA regulations. Upon such approval by the MSBA, the SBC became the local body with responsibility for shepherding the high school project through the MSBA and town approvals, as well as through the design and construction phases of the project. The SBC is simply a creature of state and local law organized pursuant to applicable regulations. Lastly, we must take issue with Mr. Grant's assertion that there has been no public involvement or input in the design of new high school, and that no opportunity exists for such input. The SBC is an appointed public body subject to the Commonwealth's open meeting laws, and as such, all meetings are publicly posted in advance. Residents who would like to learn more about the project and offer feedback are always invited to attend. We also remind Mr. Grant of the well-advertised series of public forums held to discuss the design options for the high school project during the months leading up to the May 25, 2010 Town Meeting vote approving the project. In addition, the planning board and zoning board of appeals held publicly noticed hearings on the project in November and December of 2010, respectively. All these meetings and hearings have provided and will continue to provide a multitude of opportunities for public input on decisions still to be made by the SBC. The obligation of the SBC is to the residents of Longmeadow, who so strongly supported the high school project but who will also demand that the project be constructed in a transparent and fiscally responsible way. The members of the SBC promise to continue to work diligently on behalf of our community to plan and construct a high school in which our children can receive the highest quality 21st century education available anywhere. 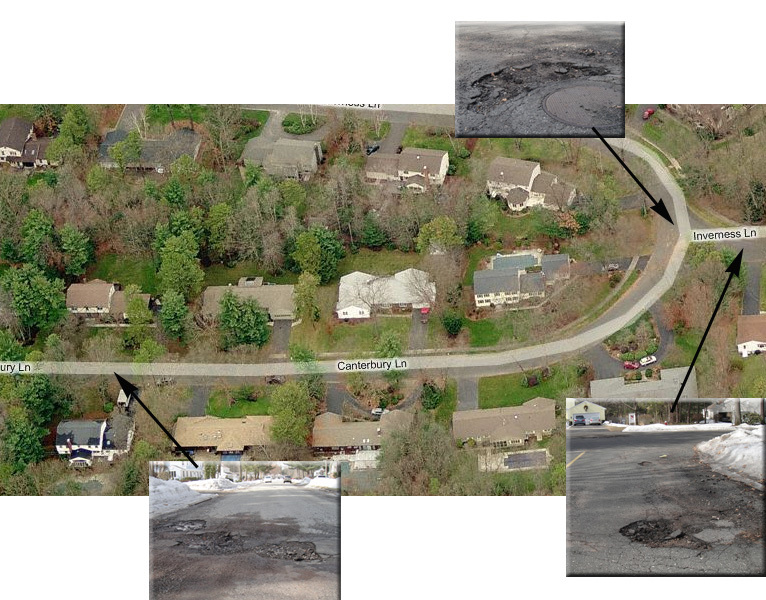 At Monday night's Longmeadow Select Board meeting chairman Rob Aseltine asked all town residents to report potholes in town by calling the DPW at 567-3400 or emailing the information to publicworks@longmeadow.org . TM Robin Crosbie reported that the local asphalt plant has opened and that hot patch (vs. cold patch) compound will soon be available to fix these problems. The town will likely concentrate initially on fixing the main streets like Converse St, Williams St which are in very poor condition before they will begin fixing the side streets. There are almost 100 miles of paved streets in the town of Longmeadow. I suspect with our limited budget resources it is possible that we will run out of money before we fix all of the town's potholes. Who put the Longmeadow SBC in Charge? Not to be impolite, but who put the Longmeadow School Building Committee (SBC) in charge? It was not the voters of Longmeadow, either at the polls or at Town Meeting. Was it the Select Board, or was it the School Committee, or was it the Town Manager? The answer to this question is surprisingly opaque. What is not opaque is the amount of power wielded by the SBC. The SBC is running an $80 million project, and it is making hugely consequential decisions not just about the expenditure of taxpayer money, but also about the design and function of the new high school, a structure we should expect to last several decades. For example, it has been deliberating on whether to include an artificial turf field as part of the project, a subject that had been before the elected School Committee and the residents of the town some three years ago. Now, with heightened safety concerns over turf fields, the unelected SBC may make this controversial decision itself. Over a year ago, I criticized the appropriateness of the SBC deciding on the design of the new high school while leaving the citizens with no voice in the design (or renovation) decision, except whether to kill the project entirely. Left unaddressed was how the SBC had gained its position of preeminence in the first place. After all, it seemed strange that a democratic form of government had produced an unelected entity with the authority to spend more money than the town entire annual budget. The publicly available documents suggested that the SBC had suddenly materialized, vested with significant powers, much like Athena springing fully clothed from Zeus's head. There had to be more. And so I submitted FOIA requests to the town relating to the creation of the SBC and the selection of its members. The documents provided by the town show that there was no action taken by the Select Board to create the SBC; rather, it proceeded directly in June 2008 to the selection of its members, as if the SBC's existence was a foregone conclusion. The town posted a notice soliciting applications from town residents to fill a few of the positions. In the end, three town residents were selected by the Select Board and School Committee. The Select Board decided to name two of its members, Paul Santaniello and Robert Barkett to the SBC. The School Committee named Christine Swanson. On July 21, 2008, the Town Manager sent a letter to the state identifying the members of Longmeadow's SBC, which also included six town employees, some of whom are not Longmeadow residents. The letter said that the "Committee was formed in accordance with the provisions of all applicable statutes, local charters, by-laws and agreements of the Town of Longmeadow." But was it so formed? The Town Charter makes no reference to a School Building Committee. In fact, the Charter says that the legislative (law-making) powers are vested in the town's voters at Town Meeting. The Select Board is vested with executive powers, i.e., not to make laws but to see that the laws are carried out. The Charter delineates the powers and limitation of other committees. Section 4-4 does provide for the formation of other committees by by-law or vote at the Town Meeting. Or, committees may be otherwise established by the Select Board or School Committee. In which case, the committees shall be monitored by their appointing authorities. No by-law or vote at Town Meeting created the SBC. If the Select Board established the SBC, there is no record of it having done so, aside from selecting some of the members, which presupposes that the SBC already existed. The most definitive action in creating the SBC was the Town Manager's July 21, 2008 letter. From the existing documents, it appears that the Town Manager selected all of the town employee members, including herself. So, who or what is the "appointing authority" that is supposed to monitor the SBC? The reality is that nobody exercises oversight over the SBC. The SBC is not answerable to the voters. It does not submit its decisions for approval to an elected board that is answerable to the voters. The SBC is a self-perpetuating entity, deciding itself who will fill any vacancies. For example, the SBC recently decided that Robert Barkett would remain on the SBC after his term on the Select Board ends. This is not to say that the members of the SBC have not done good work. They have devoted many hours of unpaid service to the town, no doubt with the best interests of the town in mind. But that is not the point. What exactly distinguishes the SBC from some other group of well-meaning people purporting to speak for the town? And that is exactly what the SBC has done and continues to do. It speaks for the town. The SBC is a power unto itself, with no one ever having prescribed any limitations on its authority. Its creation, whether a product of the Select Board, School Committee, or the Town Manager, was outside the form of government prescribed by the Town Charter. There is no reason that an SBC cannot function as an entity answerable to the voters. If our town officials are willing to endorse this undemocratic entity because the current arrangement seems to be working, then shame on them. If the voters are willing to tolerate town officials who endorse the existence of a powerful, unelected board, then shame on us.